*a quick note about diction/inclusivity: I use “knitting” here because it is the medium I am most familiar with, but please, substitute crochet or your preferred making medium. How & what you make with is valid. If you’ve been knitting for some time, you’ve probably had well-intended friends and family members post links on your Facebook wall about the “health benefits of knitting”. This NYT piece, written in 2016, has appeared at least 4 times on my own personal wall & a handful of other times in my direct messages. And it’s true, countless studies - particularly in recent years - have shown the neurological benefits of knitting. 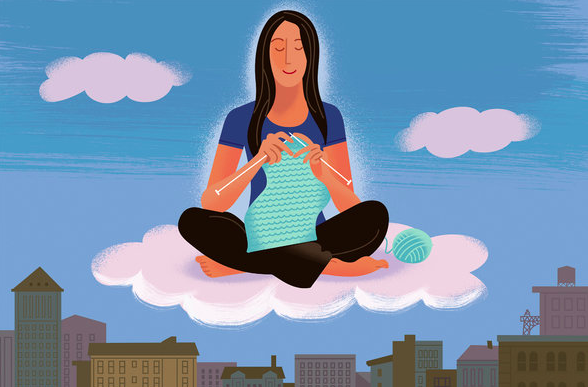 From stress and addiction management to chronic pain, knitting is cited as a key player in recovery and healing. You only need to browse the comments section of any of these articles and it’s clear that the notion of knitting as healing is widespread. I love that my friends and family members want to help me prove that my, ostensibly sometimes obsessive, interest in knitting is valid - healthy, even! To be honest, in the case of how knitting makes me feel and whether it’s valid that I spend many hours working on it weekly, I didn’t really need scientific studies or NYT articles to back it up, though I appreciate the scientific validation. Chances are, if you’re on Making Things & reading this article, you are - at least in some small way - a maker, and you might have a sense for what I’m talking about here. It’s the feeling that you get when you cast on a new project - the sense that perhaps anything actually is possible - and I don’t mean that in a grand sort of way, just in this simultaneously humbling and inspiring way. You possess these appendages on your body that can turn what is essentially a piece of string into a functional, wearable object. And the cast on is, I think, the most potent time for this realization of possibility. As you progress and this object starts to take shape, you have visible, tangible proof that you are, indeed, very capable. There’s something to that, especially for millennials, and especially in this remarkably digital age. The ability to physically manifest cloth that is practical, warm, and beautiful feels particularly relevant when most of us work on computers, maybe even remotely, on projects that will never have a physical presence in the world. When we exist so much on the internet, these points of contact with the “real” world take on more weight. Of course, with the incredible diversity of the making community, there comes a wonderful diversity of personal experience and reasons for making, but I’d argue that this diversity is united in commonalities - the way in which we’re all navigating the human condition. We find ourselves drawn to knitting not just because it’s rad to wear something you’ve made (although it definitely is, and somehow even 10+ years into knitting, this novelty has not worn off for me), but because it’s something inherently human. We’re all making sense of our world, processing internal and external events & knitting helps us do this. In the rest of this series, I invite you to consider your relationship to knitting/making. In essay 2, I’ll look at the ways we use knitting to show our love for our friends and family, and consider the ways that we honor our familial and historical traditions through our craft.